Penguin Random House might have no interest in staying in the Australian retail market, but South Africa is a different matter. 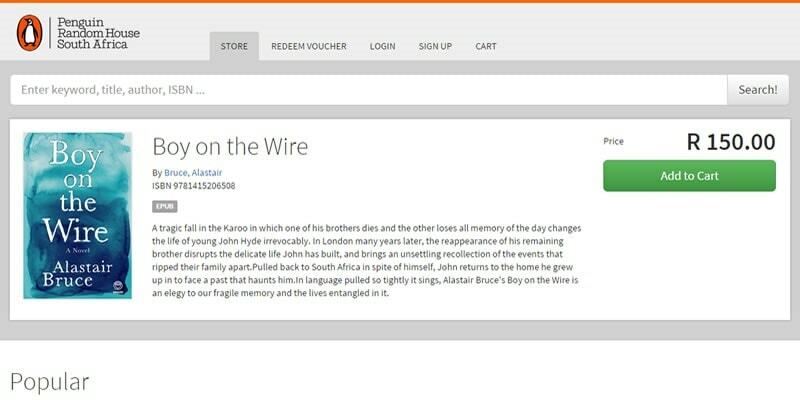 The largest South African trade publisher, Penguin Random House South Africa (PRHSA), has announced the launch of its eBook store. Listing only South African titles, this new initiative will focus on the SA market. The PRHSA store will offer the publisher’s full catalogue digitally, which includes a range of South African fiction, non-fiction, lifestyle, and nature titles. Some of the books on offer are A Complete Guide to the Snakes of Southern Africa, Boy on the Wire, and Low Carb is LEKKER. The store officially launched on 31 July at the South African Book Fair in Johannesburg, and can be found on the Snapplify website. It carries around 800 titles in Epub and PDF formats. The ebooks are encumbered by Snapplify's proprietary DRM and can be read in Snapplify's apps for Android, iOS, Windows, or OSX. In fact, this ebookstore is built entirely on Snapplify's platform, raising questions about what will happen to a customer's ebooks should the publisher cancel its contract or Snapplify pivots away from niche ebook retail. Hachette's solution to that issue was to build an ebookstore that used digital watermark DRM, rather than the more common encryption DRM like Kindle or Adobe. Of course, Hachette's bookstore was never launched, but that doesn't change the fact that it was still the better set up.